For her upcoming show at The Ravestijn gallery, Eva Stenram further explores her use of found images and what it means to be looking at them. ‘Offcut’ consists of three works that combines the photographic with three dimensional installation. As in her previous work, Stenram uses found vintage pin-up photographs from which she makes new images. Central to this exhibition are the fabrics seen in each of the found pin-up pictures: thus attention is drawn to the background and surrounding details in the image, rather than to its ‘object’, a woman. The fabrics are rendered tangible in the material space of the gallery, both disrupting and expanding the narrative that the found image originally implied. These new fabrics incorporate and repeat photographic characteristics such as foreshortening, as well as the creases and folds in the fabric that was photographed many years ago. PR Info _ For her upcoming show at The Ravestijn gallery, Eva Stenram further explores her use of found images and what it means to be looking at them. 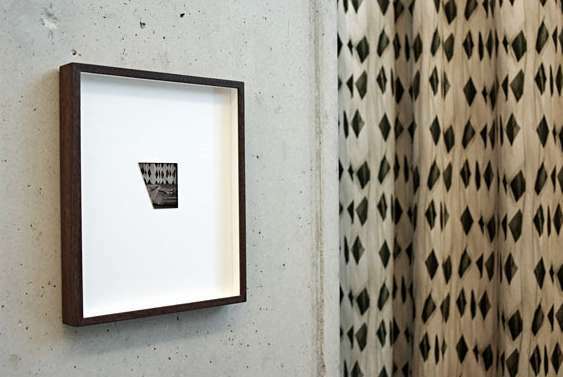 ‘Offcut’ consists of three works that combines the photographic with three dimensional installation. As in her previous work, Stenram uses found vintage pin-up photographs from which she makes new images. Central to this exhibition are the fabrics seen in each of the found pin-up pictures: thus attention is drawn to the background and surrounding details in the image, rather than to its ‘object’, a woman. The fabrics are rendered tangible in the material space of the gallery, both disrupting and expanding the narrative that the found image originally implied. These new fabrics incorporate and repeat photographic characteristics such as foreshortening, as well as the creases and folds in the fabric that was photographed many years ago. As in the series ‘Parts’ and ‘Drape’, Stenram digitally ‘cuts up’ existing images in order to examine her own relationship with them as a viewer. For this new show, she further complicates the relationship between the viewer and the image up to the point of interfering in the actual conditions for looking themselves. Stenram’s work is rich in its art-historical references – from Durer’s window to the world to Dada’s cut-up techniques, the Surrealists’ fragmentation of the female body, and the visual language of Pop art. The works display a mixture of the uncanny and the humorous, the commercial and the idle. At the same time her work questions the status of the photographic image today. In a culture that privileges vision above all other senses, Stenram’s installations make the viewer aware of her or his own act of looking in relation to the fantasy of touch implied. By materialising elements, in this case fabrics, from within the picture, the conditions – and the expectations that come with them – for viewing are altered. One of the works on show, titled ‘Split’, requires the viewer to sit in a chair, that might as well have been part of the original picture, thus changing the traditional viewpoint by suspending the vanishing point of a photograph. Although the viewer is still drawn in aesthetically, the notion of scopophilia is interrogated and reconfigured by these installations. The title of this exhibition, Offcut, may point to the pieces of fabric made tactile for the viewer, to a set of neglected negatives that never made the final ‘cut’, and, most importantly, to what lies beyond the framing or instant that the photograph was taken. The question of what larger part has been removed, is kept lingering.